On Friday, March 1, 2019, MOV International met! Who would have imagined a decade ago that one day a meeting of international MOV Team Leads would take place. It was surreal! I have been praising God that His vision begun in India not only has spread to impact 22 countries, but now includes active ministry teams in four nations. PRAISE GOD! Who would have imagined a decade ago that His vision begun in India not only has spread to 22 countries, but now includes active ministry teams in four nations. This historic event began as Pastor Charles Mwase and I met for a conference in Blantyre, Malawi. 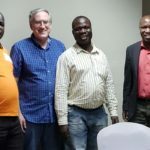 Since we first met in February 2016 at MOV’s first Malawi conference, we have only communicated by email and an occasional phone call – so we spent many hours catching up. 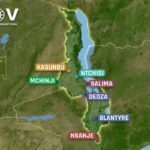 I wanted to hear about his family, especially his little girl who had recently suffered broken legs when hit by a motorcycle; his pastoral ministries; and of course about the work of MOV in Malawi, in neighboring countries, and his thoughts for the future. God refreshed our friendship; renewed our mutual commitment to the men, families, churches and communities of Malawi; and “strengthened our hand” in Him. Then Pastor Green Ngusa, new MOV Team Lead from Tanzania, arrived. We met a couple years ago when I was in Mbeya. Green and Charles led two conferences in Tanzania in 2018. I learned during my visit with Green that his wife, Grace, and their family are sold out for the cause of the Lord through Men of Valor. Lastly MOV-Kenya Team Lead Pastor Michael Orieny arrived. As with Charles and Green, Michael and I have communicated by phone and email, and even though we met briefly at two conferences in Kenya in 2016 and 2017, we needed this extended time for me to hear about his family and other ministries; to facilitate an effective working relationship; and to confer about plans for Kenya. As I met individually with each man, our shared mission and purpose was clear! Again, our hands were mutually strengthened in the Lord. These men are as equally committed to the recovery of men and the revival of marriages, families, churches and communities as you and I are. These men see the faltering state of manhood having a huge impact on their respective countries’ well-being. Long-term community improvement will not happen if men are not reached and discipled. These men are as equally committed to the recovery of men and the revival of marriages, families, churches and communities as you and I are. 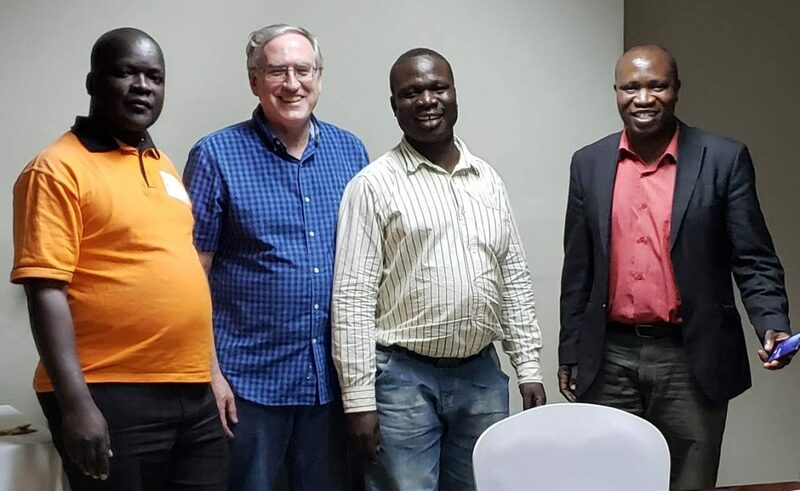 Then, Charles, Green, Michael, and I, along with Cameron and Thomson from Charles’ team, met and discussed the details about conferences and ministry strategy. We talked about conference preparations, methods of communicating, the power of stories and illustrations, key points, and ways to bolster the primary principles. 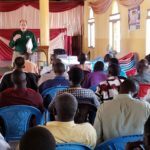 We discussed operations, such as sharing the load with a team; conference follow-up with individuals, groups and churches; procedures for requesting resources; the realities of fundraising; and quality ministry reports. That’s 22 conferences… as soon as possible! Am I tense? Concerned? Yes! How can this be done? These men clearly have vision and an immense passion for reaching men with the gospel and for changing their countries and surrounding countries through building men of valor. I am extremely excited to have each of them on the MOV team. These men see the faltering state of manhood having a huge impact on their respective countries’ well-being. Please pray for all of us at Men of Valor International that the Lord would clearly set the path ahead. “Many are the plans in the mind of a man, but it is the purpose of the Lord that will be established.” Proverbs 19:21 (RSV) We will trust Him for His provision and will step out in faith. 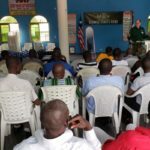 Men of Valor International jumpstarts men’s discipleship through conferences that energize men to live out their biblical position, priorities and practices as men of God. Copyright 2019 Men of Valor International. All rights reserved. Enter your email address below to receive email updates from Men of Valor, so you can stay up to date on how God is using MOV to have an impact all over the world!